The squadron was established in 1949 as Composite Squadron VC-33 at NAS Norfolk. It flew the TBM-3E/N/Q Avenger and a few SNB-5 Texans. Its mission was antisubmarine warfare (ASW). It moved to NAS Atlantic City in 1950, where its mission changed to night attack. It sent three detachments to the Korean War aboard carriers, where it distinguished itself in night attack and ECM missions. 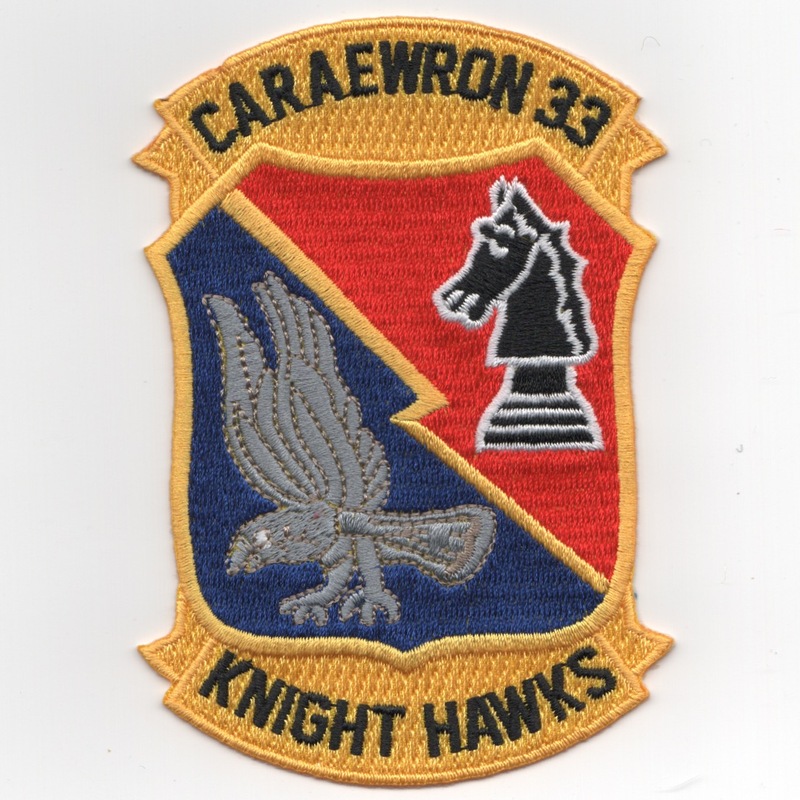 In 1952, it adopted the nickname Nighthawks, and in 1956 was redesignated as an All-Weather Attack Squadron VA(AW)-33. In 1958, the squadron moved to NAS Quonset Point, and was soon redesignated Carrier Airborne Early Warning Squadron VAW-33. In 1961, it began providing ASW detachments to antisubmarine carriers in the Atlantic Fleet. In 1966, a VAW-33 detachment supported the recovery of the Gemini IX spacecraft. From 1967-1968, VAW-33 provided carrier-based ECM services in the Vietnam War zone. Returning to NAS Norfolk in 1970, the squadron, now designated VAQ-33, adopted the Firebirds nickname, and came under operational control of the Fleet Electronic Warfare Support Group. Its new mission was to simulate electronic threats to units of the fleet. 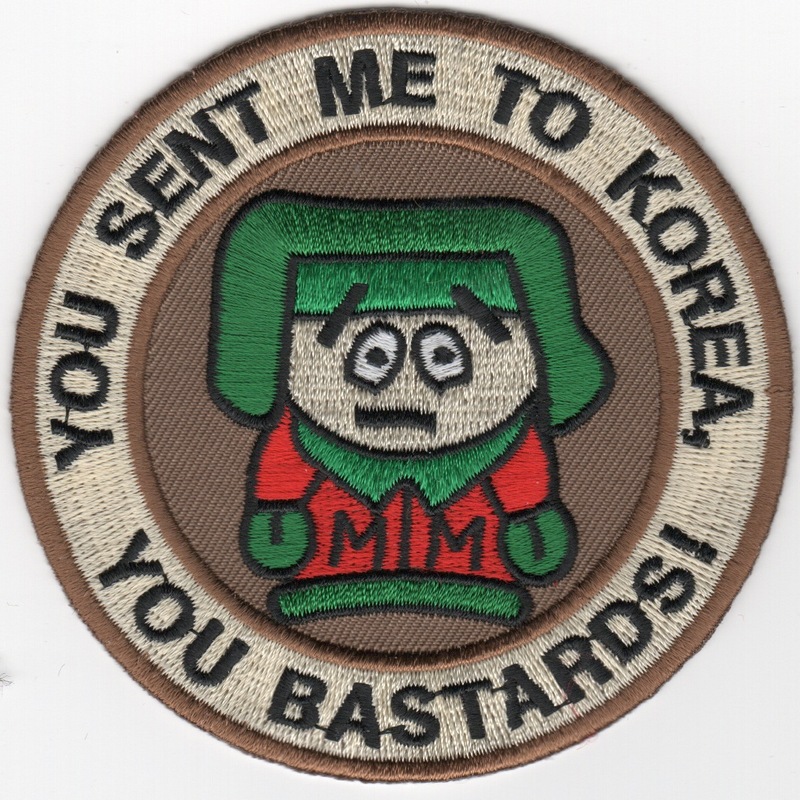 This patch is a reproduction and does not have velcro attached. 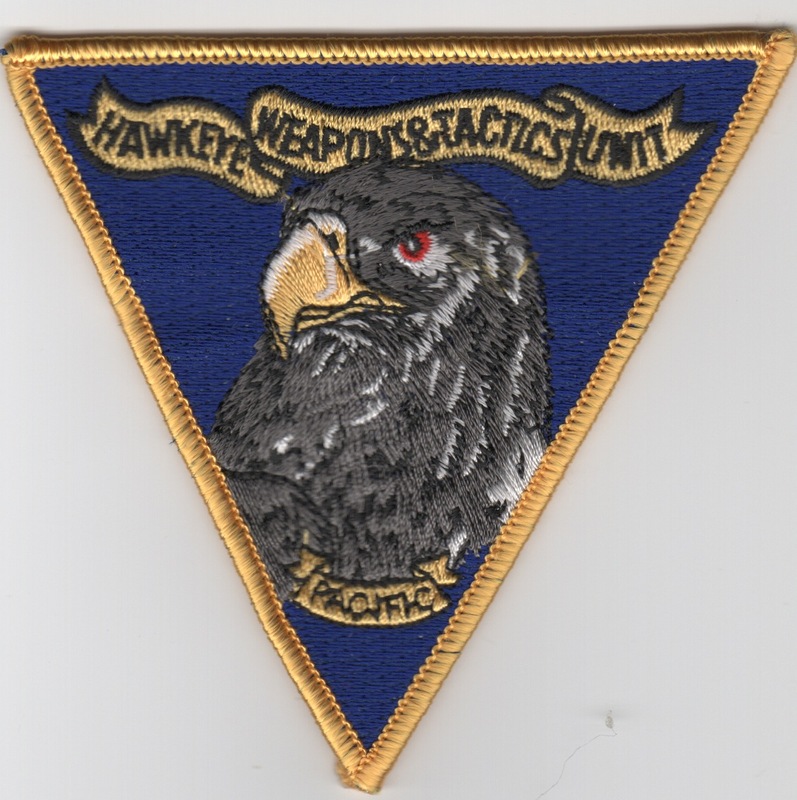 This is one of the 50th anniversary patches created by the "Hawkeye" community (note the black hawkeye head). It has 15 stars around the border, not sure of the significance of that. This patch does not have velcro. 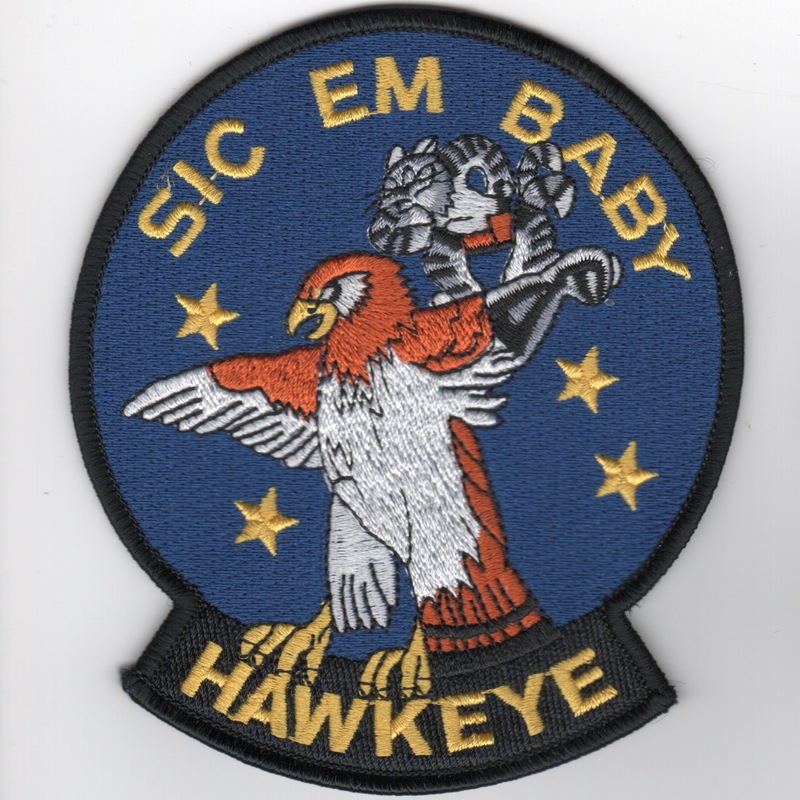 E-2 Hawkeye "Sic 'Em Baby"
This patch was created by the US Navy's "Early Warning" community because of their mission. The E-2Cs are the Navy's Eyes in the Sky as they sit back and vector the Navy Fighters into their intercepts. Pretty vital protection role for the carrier group. This patch does not come with velcro attached. 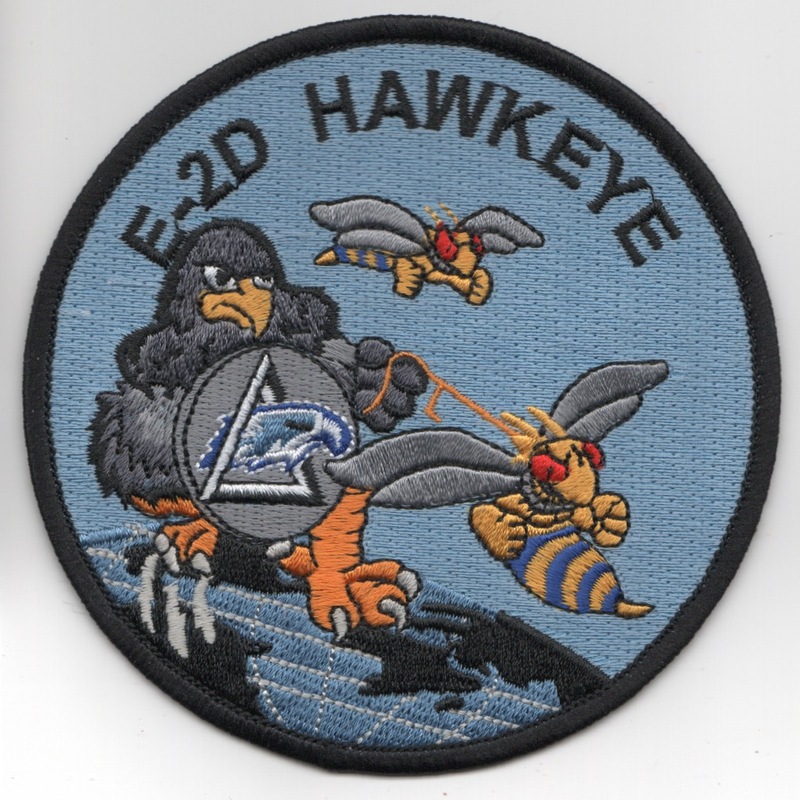 This is the yellow version of the E-2C Hawkeye patch created for the Navy's Early Warning aircraft. 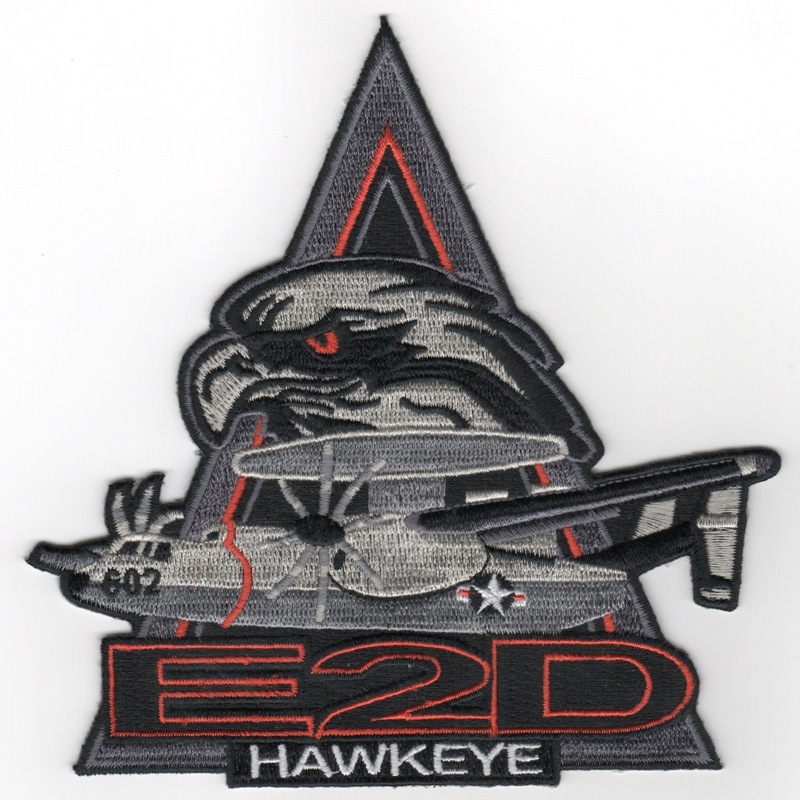 This is the gray version of the "Eyes of the Fleet" patch created for the E-2C Hawkeye. 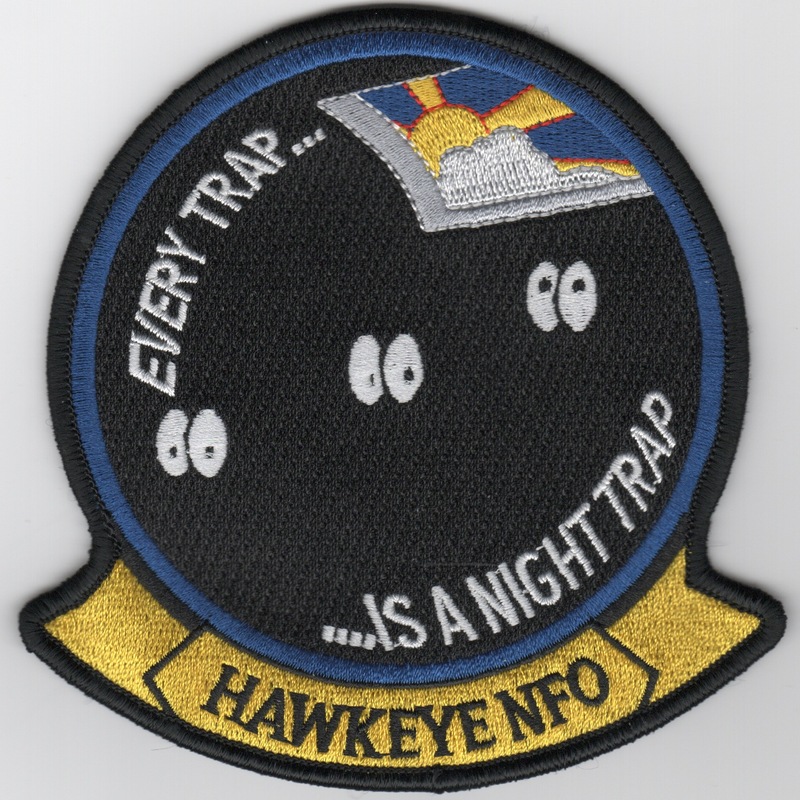 Having flown in the back of the Hawkeye, this statement is correct...."Every Trap is a Night Trap" for those in the back of the aircraft!! This is the medium-sized version of this patch and does not come with velcro already attached. Having flown in the back of the Hawkeye, this statement is correct...."Every Trap is a Night Trap" for those in the back of the aircraft!! 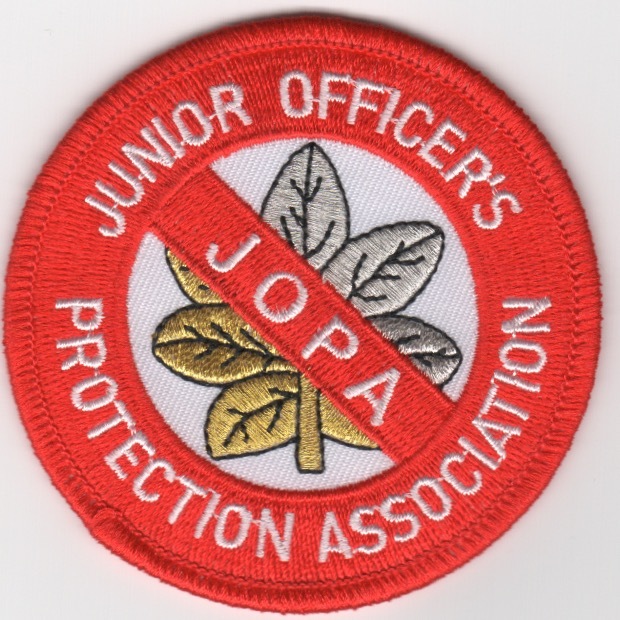 This is the larger-sized version of this patch and does not come with velcro already attached. I don't have any info on this patch, other than to say it came in with tons of other USN items. Anyone have any info, I'd appreciate it. 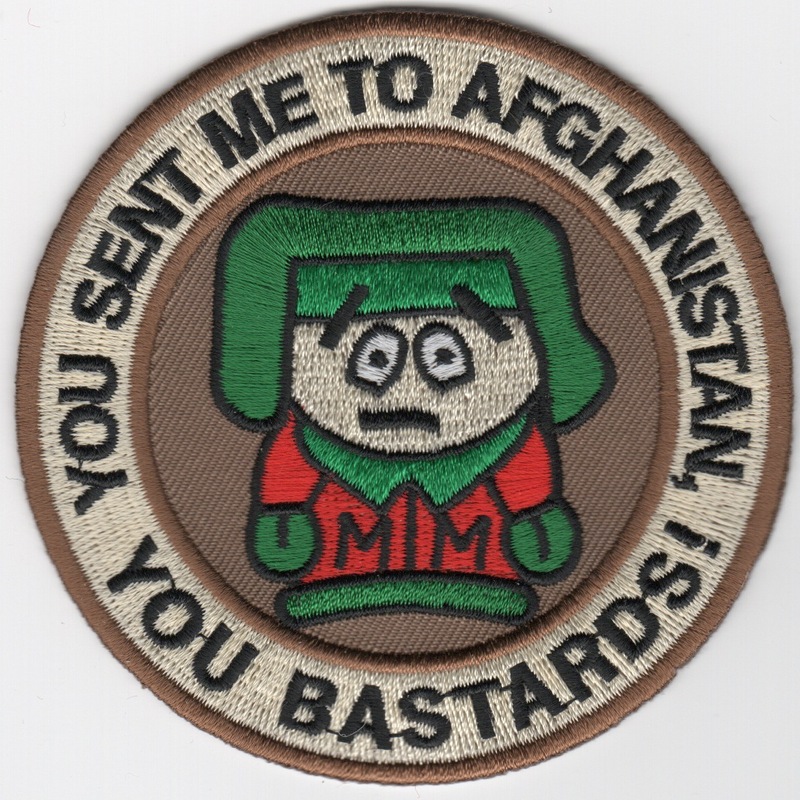 I do know it's from a VAW (E-2C Hawkeye) squadron initially, but since then, several have adopted it as a Friday patch. It has the character from "The Family Guy" (I think) that's always saying something similar to this. Any more info would be appreciated. This is the squadron patch from the "Photographic Squadron One", established in October 1942. They were disestablished in December 1945, but during that time, flew PB4Y-1s. This is a reproduction patch. This is the red/black triangular version of the E-2C Hawkeye Weapons & Tactics Unit (WTU/WTI) school. 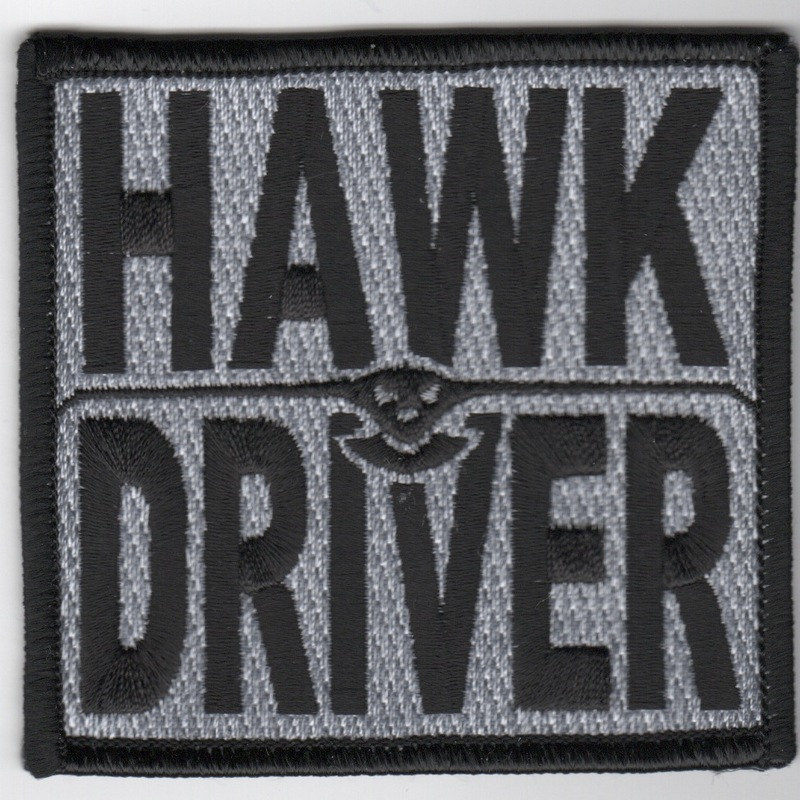 It shows the Hawkeye head on the patch......This patch does not come with velcro attached. This is the subdued triangular version of the E-2C Hawkeye Weapons & Tactics Unit (WTU/WTI) school. 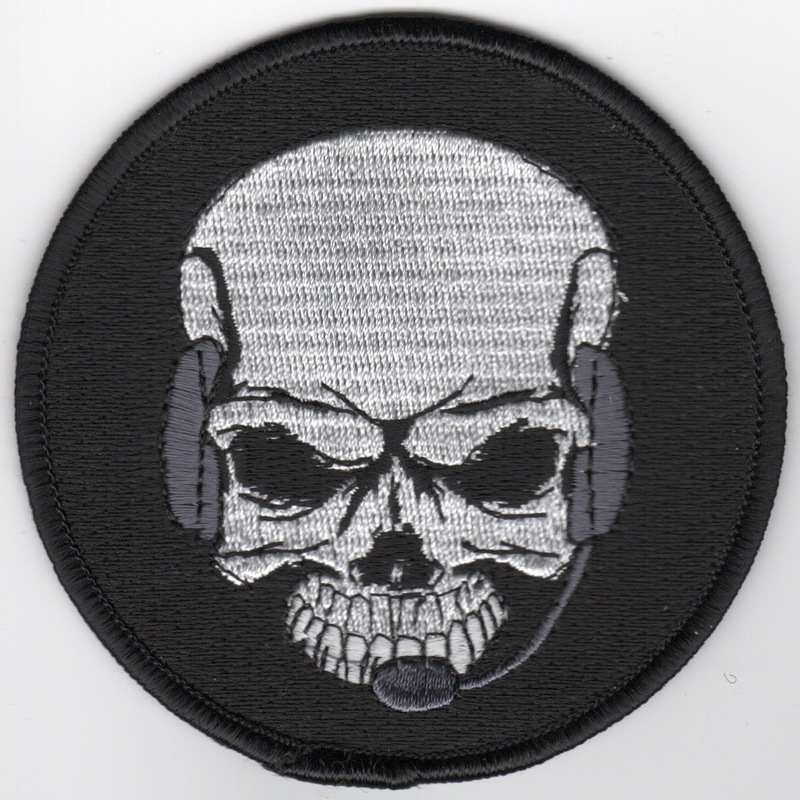 It shows the Hawkeye head on the patch......This patch does not come with velcro attached. 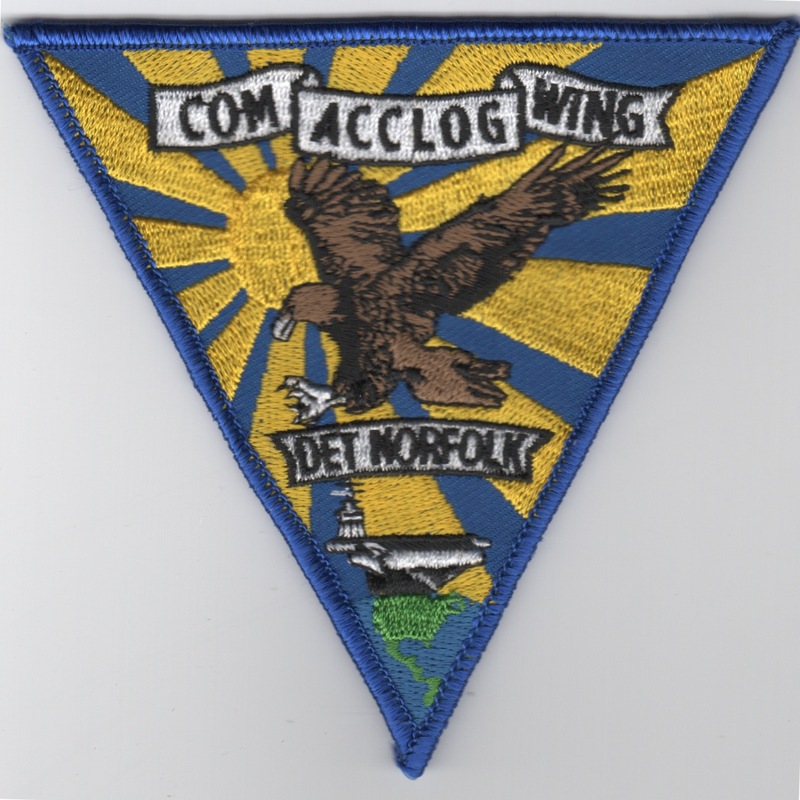 This is the triangular version of the E-2C Hawkeye patch for the COMMACCLOGWING, Det Norfolk. This patch does not come with velcro attached. Known as the "Hummer", the Hawkeye was the replacement for the Grumman Tracer, and was intro'd into the Fleet in 1964. Eventually evolving into the E-2C flown in today's Airwings, the E-2C offers unmatched radar capabilities of number of targets tracked, detection and processing capabilities, and JTIDS. Over 150 have been produced and are flown from NAS Norfolk, VA and NAS Miramar, CA. Along with their carrier-protection responsibilities, they are also working with the DEA and US Customs in the drug-interdiction roles. 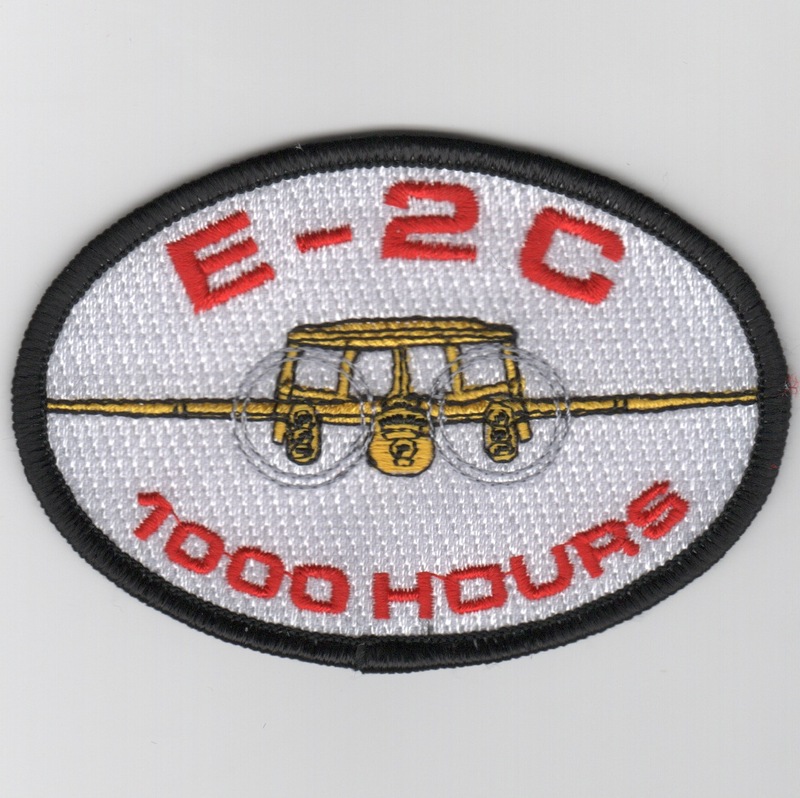 This is the white version of the 1000 hours patch and is worn by those who have logged 1000 hours of flight time in the Hawkeye. This patch does NOT come with velcro attached. Known as the "Hummer", the Hawkeye was the replacement for the Grumman Tracer, and was intro'd into the Fleet in 1964. Eventually evolving into the E-2C flown in today's Airwings, the E-2C offers unmatched radar capabilities of number of targets tracked, detection and processing capabilities, and JTIDS. Over 150 have been produced and are flown from NAS Norfolk, VA and NAS Miramar, CA. Along with their carrier-protection responsibilities, they are also working with the DEA and US Customs in the drug-interdiction roles. 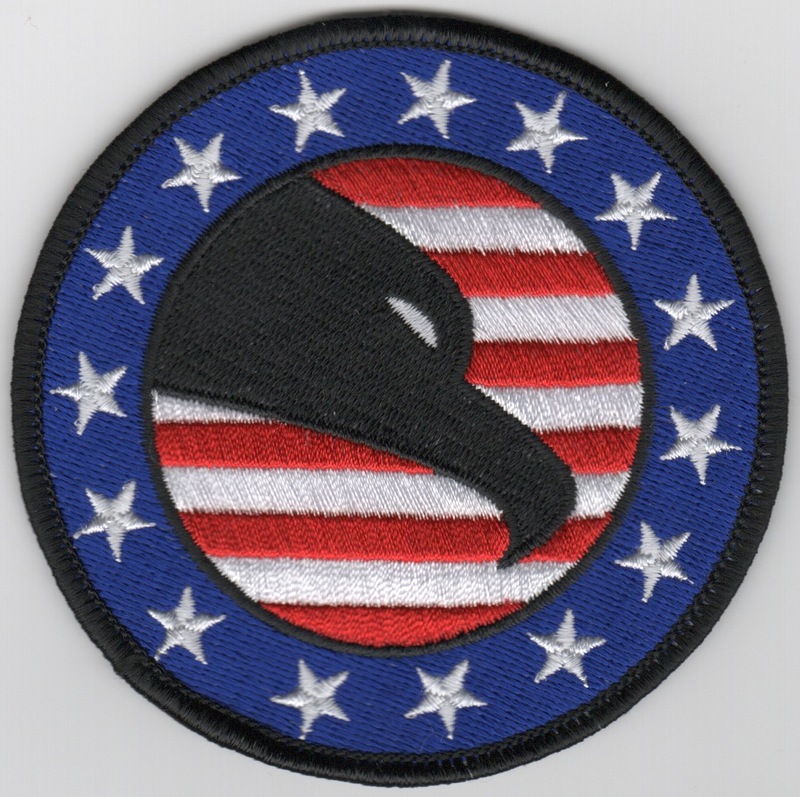 This is the blue version of the 1000 hours patch and is worn by those who have logged 1000 hours of flight time in the Hawkeye. This patch does NOT come with velcro attached. Known as the "Hummer", the Hawkeye was the replacement for the Grumman Tracer, and was intro'd into the Fleet in 1964. Eventually evolving into the E-2C flown in today's Airwings, the E-2C offers unmatched radar capabilities of number of targets tracked, detection and processing capabilities, and JTIDS. Over 150 have been produced and are flown from NAS Norfolk, VA and NAS Miramar, CA. Along with their carrier-protection responsibilities, they are also working with the DEA and US Customs in the drug-interdiction roles. 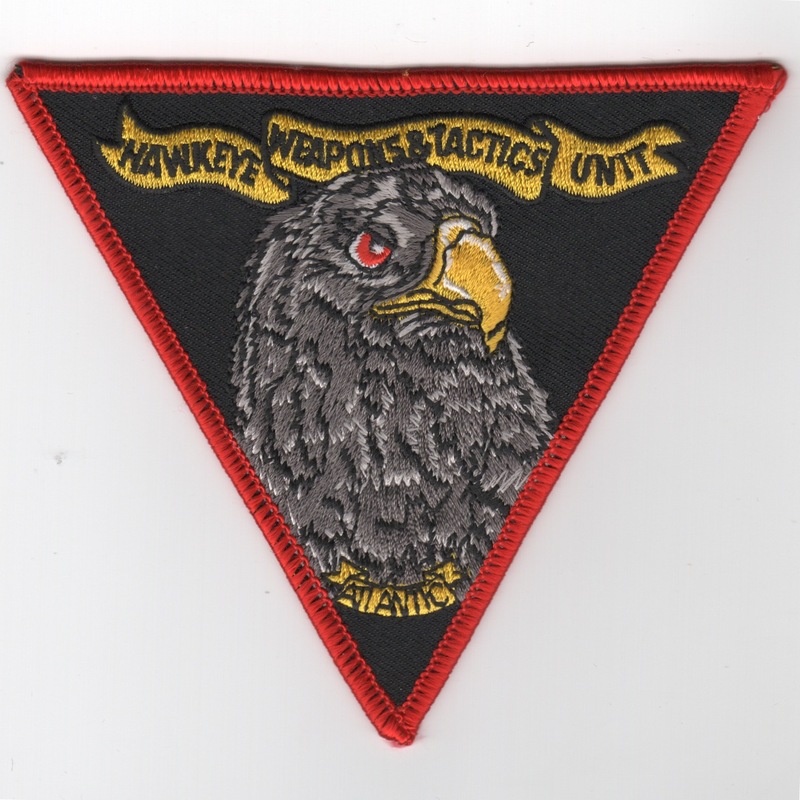 This patch represents and is worn by those who have logged 2000 hours of flight time in the Hawkeye. This patch does NOT come with velcro attached. Known as the "Hummer", the Hawkeye was the replacement for the Grumman Tracer, and was intro'd into the Fleet in 1964. Eventually evolving into the E-2C flown in today's Airwings, the E-2C offers unmatched radar capabilities of number of targets tracked, detection and processing capabilities, and JTIDS. Over 150 have been produced and are flown from NAS Norfolk, VA and NAS Miramar, CA. Along with their carrier-protection responsibilities, they are also working with the DEA and US Customs in the drug-interdiction roles. 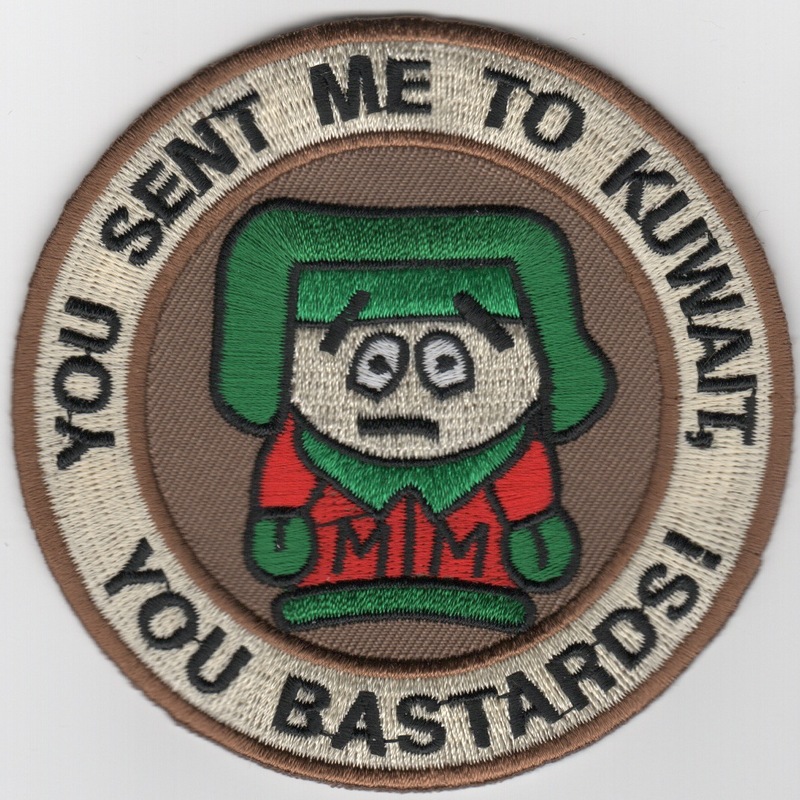 This patch represents and is worn by those who have logged 3000 hours of flight time in the Hawkeye. This patch does NOT come with velcro attached. Known as the "Hummer", the Hawkeye was the replacement for the Grumman Tracer, and was intro'd into the Fleet in 1964. Eventually evolving into the E-2C flown in today's Airwings, the E-2C offers unmatched radar capabilities of number of targets tracked, detection and processing capabilities, and JTIDS. Over 150 have been produced and are flown from NAS Norfolk, VA and NAS Miramar, CA. Along with their carrier-protection responsibilities, they are also working with the DEA and US Customs in the drug-interdiction roles. 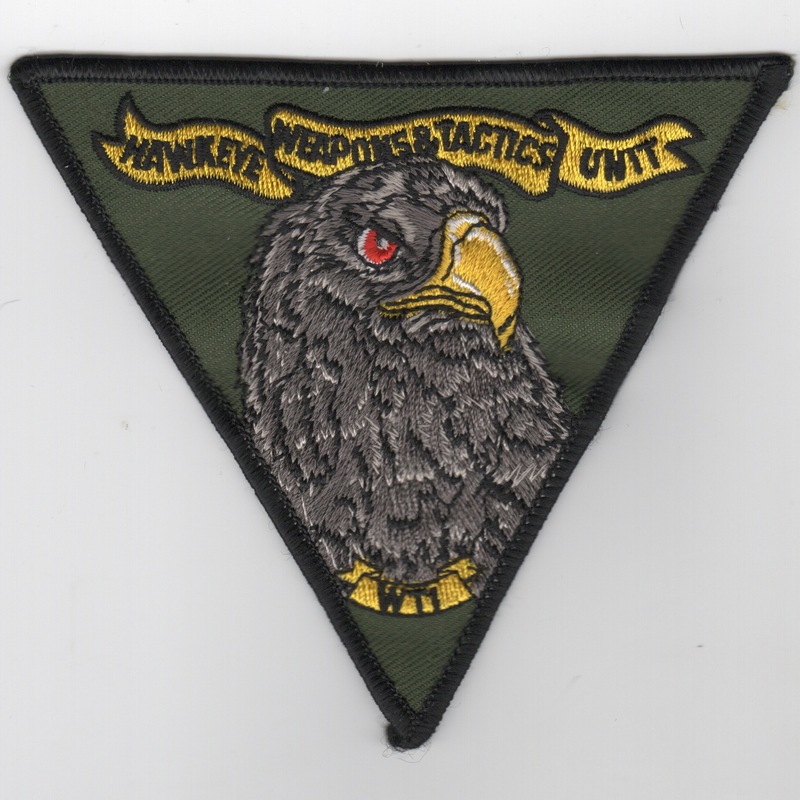 This patch represents and is worn by those who have logged 4000 hours of flight time in the Hawkeye. This patch does NOT come with velcro attached. Known as the "Hummer", the Hawkeye was the replacement for the Grumman Tracer, and was intro'd into the Fleet in 1964. Eventually evolving into the E-2C flown in today's Airwings, the E-2C offers unmatched radar capabilities of number of targets tracked, detection and processing capabilities, and JTIDS. Over 150 have been produced and are flown from NAS Norfolk, VA and NAS Miramar, CA. Along with their carrier-protection responsibilities, they are also working with the DEA and US Customs in the drug-interdiction roles. 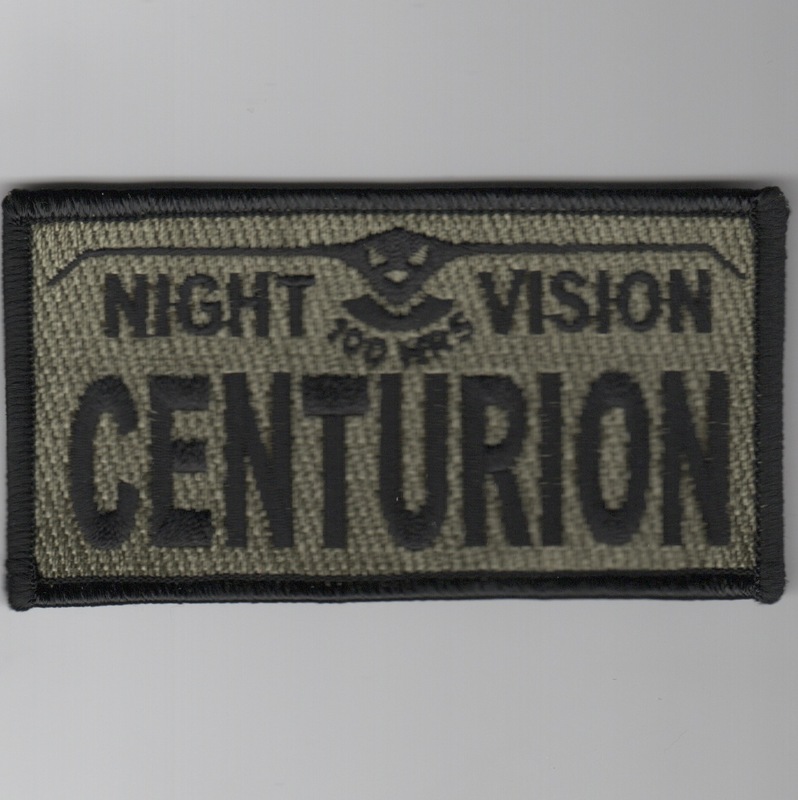 This patch is worn by those who have 100+ hours using NVGs while flying the Hawkeye. It does not have velcro on it. Known as the "Hummer", the Hawkeye was the replacement for the Grumman Tracer, and was intro'd into the Fleet in 1964. Eventually evolving into the E-2C flown in today's Airwings, the E-2C offers unmatched radar capabilities of number of targets tracked, detection and processing capabilities, and JTIDS. Over 150 have been produced and are flown from NAS Norfolk, VA and NAS Miramar, CA. Along with their carrier-protection responsibilities, they are also working with the DEA and US Customs in the drug-interdiction roles. This patch is worn by the pilots qualified in this aircraft. It does not have velcro on it. This patch was created for the E-2C "Moles" (as they are affectionately called) that control aircraft in the back of the Hawkeye aircraft. Their job is vital, yet often under-appreciated. This patch does not have velcro. 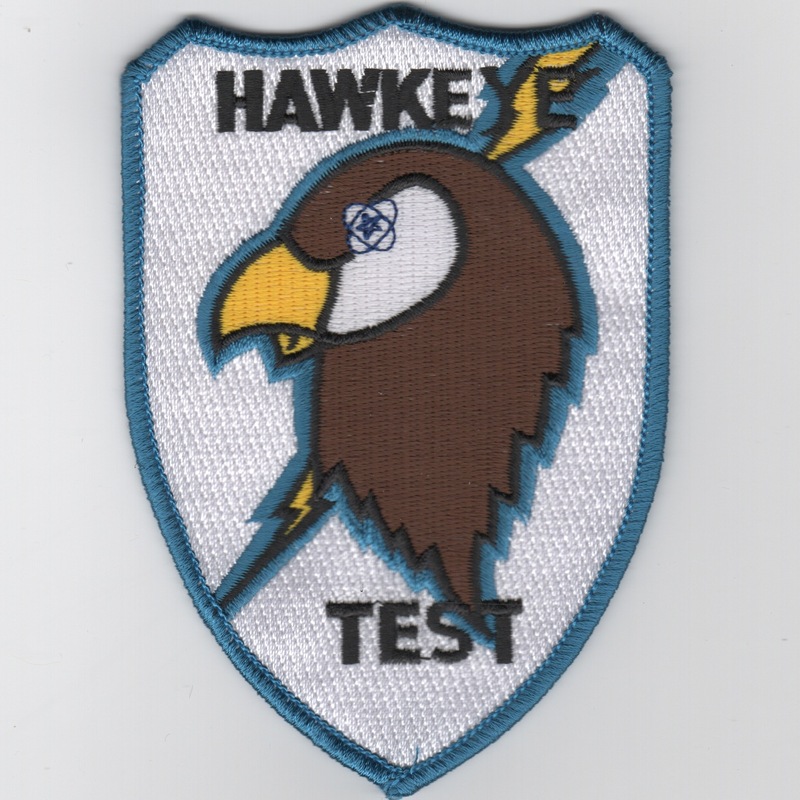 This is the shield patch created for the E-2C Hawkeye Test crew. This patch does not come with Velcro already attached. 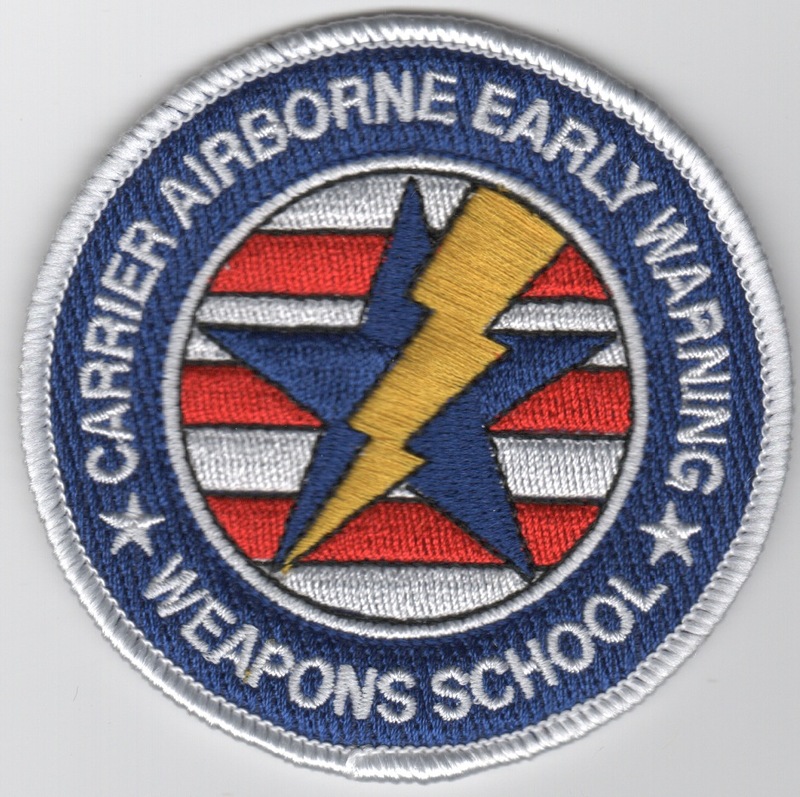 This is the patch created for the Carrier Airborne Early Warning (AEW) Weapons School. It depicts a lightning bolt through a blue star and is earned by those from the E-2 Community that graduate. 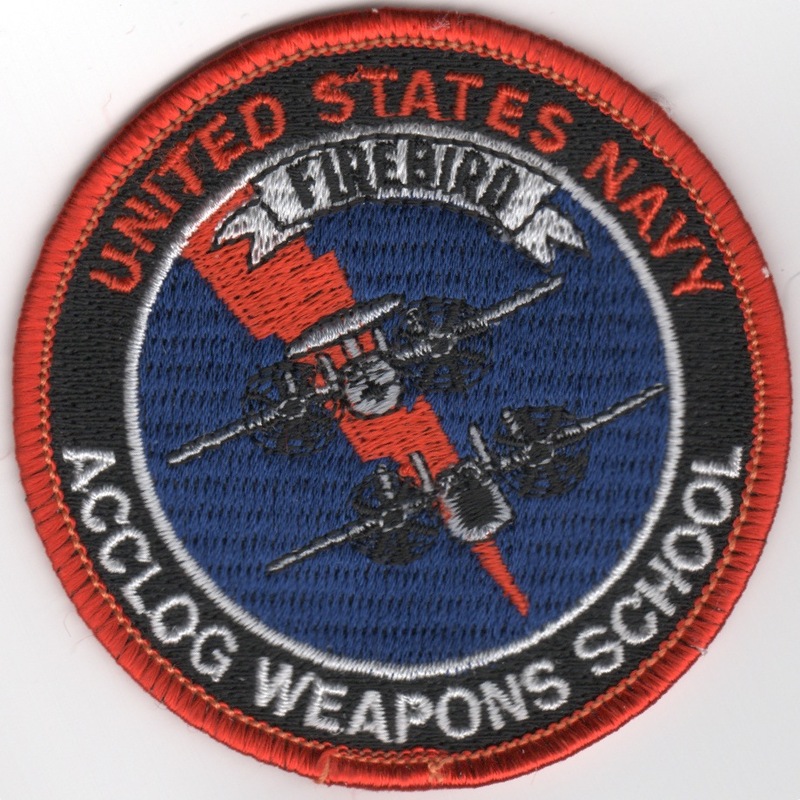 This is the patch created for the ACCLOG Weapons School. It depicts a lightning bolt through the E-2C Hawkeye and C-2 Greyhound and says "FIREBIRD" at the top. 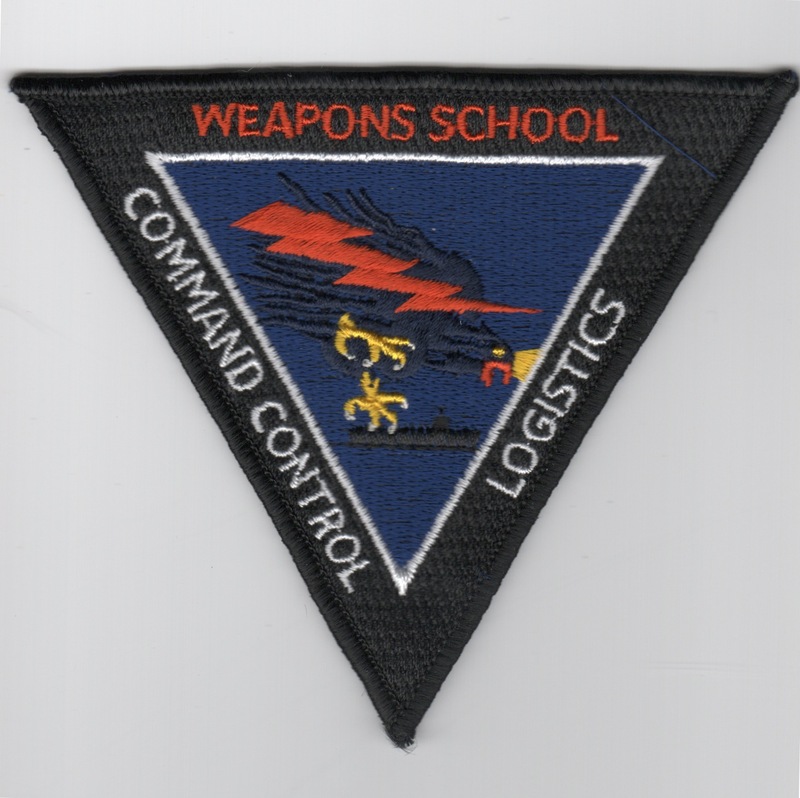 This is the triangular black version of the patch created for the C2 (Command and Control) Logistics Weapons School. It depicts a lightning bolt through the E-2C Hawkeye and does not come with velcro attached. 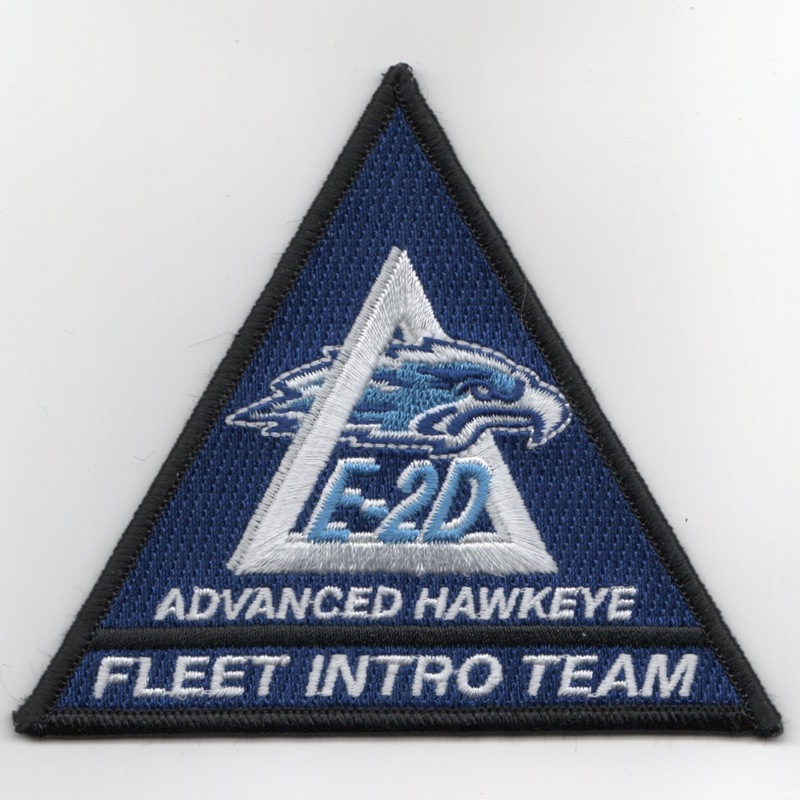 This is the round, blue version of the E-2D Hawkeye aircraft patch and does not come with velcro attached. Another AV8RSTUFF creation: This is the black, triangular version of the E-2D Hawkeye aircraft patch and does not come with velcro attached. While I can't fix the damn image, the patch IS NOT messed up at the top (only in the picture). Another AV8RSTUFF creation: This is the dark blue, triangular version of the E-2D ADVANCED Hawkeye Fleet Intro Team (F.I.T.) aircraft patch and does not come with velcro attached. 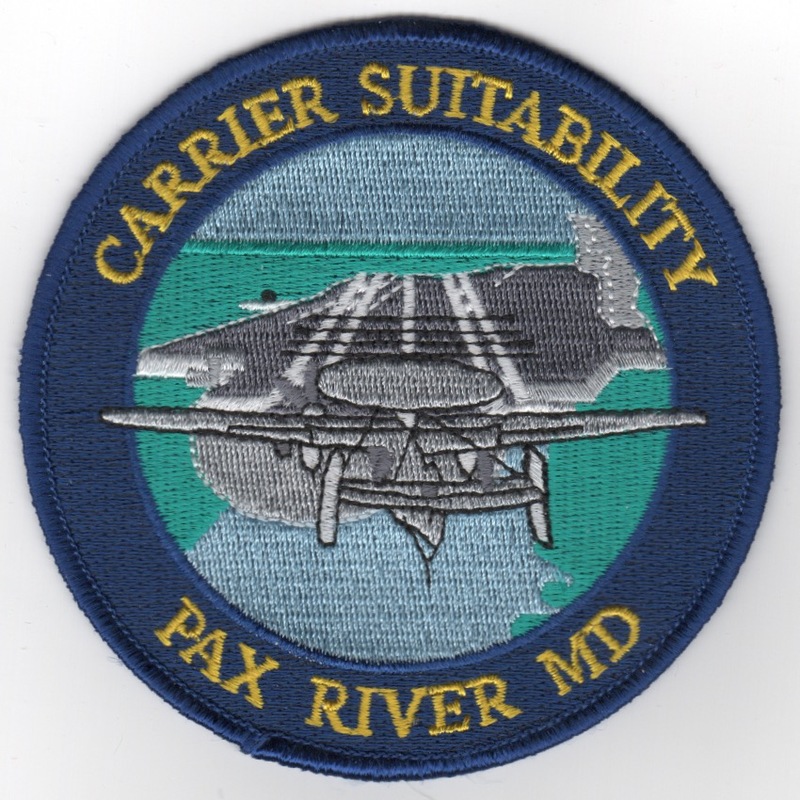 This is the patch created by the VAW community for their E-2D "Carrier Suitability" for their testing of the aircraft in the carrier environment. This patch does not have velcro attached. For many years, US Naval Aviation was known as the "Grumman Navy" due to the large percentage of aircraft that were produced by the Grumman Ironworks. These aircraft consisted of the A-6E Intruder, EA-6B Prowler, F-14 Tomcat, the E-2C Hawkeye, and the C-2 Greyhound. 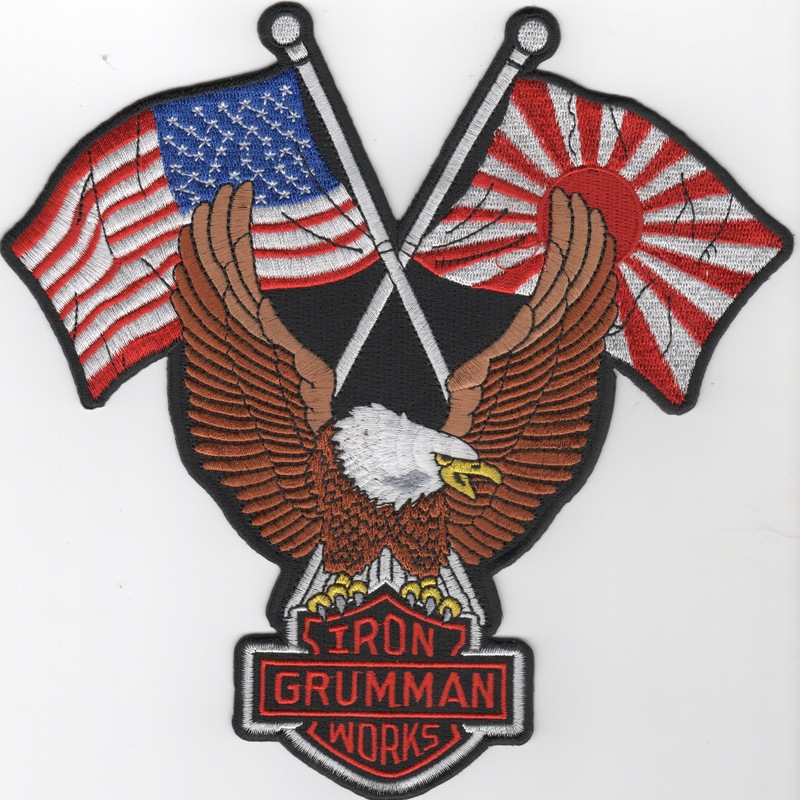 This is the EXTRA LARGE version of the famous Grumman patch depicting the American and Japanese flags in the background. For many years, US Naval Aviation was known as the "Grumman Navy" due to the large percentage of aircraft that were produced by the Grumman Ironworks. These aircraft consisted of the A-6E Intruder, EA-6B Prowler, F-14 Tomcat, the E-2C Hawkeye, and the C-2 Greyhound. Homepage | Order VAW Patches!